Our annual conference is the highlight of our Retina UK calendar and will be held on Saturday, 28 September 2019 in Milton Keynes. Attendance is free to members of Retina UK and their guides and we suggest a £30 donation for non-members. Registering your place early is recommended. We are excited to announce our first Professionals’ Conference will be held in Milton Keynes on Friday, 27 September 2019. This event is free to attend. We are joining with Usher Kids UK to organise an event specifically to address the needs of families and children living with Usher syndrome. This will be held in Birmingham on Saturday, 22 June 2019. It is free to attend. 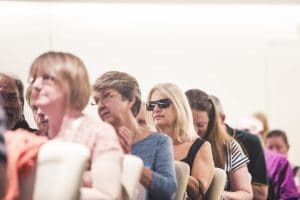 Our Information Days feature research updates, information about vision technologies, presentations from local sight loss charities, question and answer sessions and they offer a chance to meet members of the Retina UK community. Free to attend, these events always prove popular with delegates.